Police violence is a regular Saturday occurrence. The guys who get hurt and injured aren’t hooligans, but protesters. I got involved, right at the start of December, when I saw these horrendous images of the maimed circulating on social media. And I mean maimed: I’ve counted 23 people who’ve lost an eye, five who’ve lost a hand. To call out the violence, David Dufresne set up a website, in partnership with Mediapart, an independent newspaper. Ironically named “Hello Home Office, Justice Department” (referencing a Twitter expression to flag illegal or offensive content to the police), his platform itemizes casualties since the beginning of the yellow vest movement. The site details injuries reported by category. Of the 550 reports cataloged, more than 222 concern head injuries, with at least 20 with cases of eye loss and five reported arm loss. Of the victims, 419 were demonstrators, 57 journalists, 37 minors, 19 bystanders and 18 medical personnel. 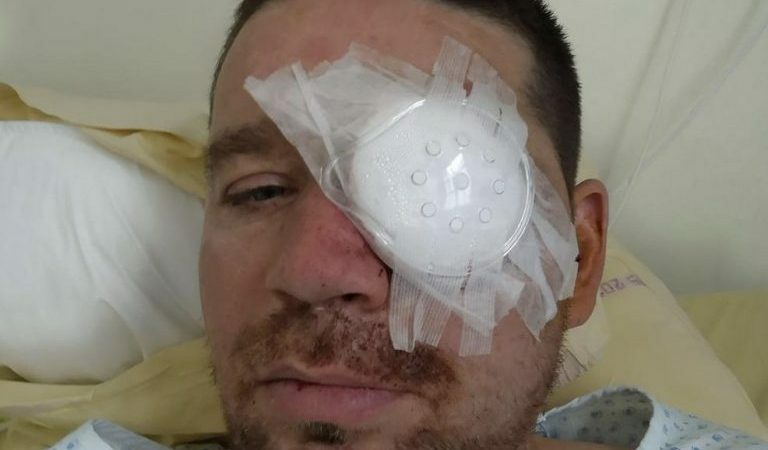 On Twitter, Dufresne shares photos of injuries sent by the victims. At times extreme, images show grave injuries sustained at the hands of law enforcement officers during protests. Police violence: We now have at least 260 reports from @davduf. @CheckNewsfr calculates 93 seriously injured, 13 of whom have lost an eye. A Gilet Jaune is reportedly in a coma. Many journalists have also been wounded. One thing remains constant: the government’s silence. The violence and repression raise questions. Why are so many protesters losing an eye or a hand in these demonstrations? French law enforcement has been using a particular weapon referred to as ‘less-lethal rubber bullet gun‘ (lanceur de balle de défense, or LBD, in French). Made in Switzerland, originally designed to prevent killing or seriously wounding a target, this projectile launcher is controversial. Detractors say this weapon is entirely unsafe. Between 2004 and 2013, serious injuries of around 30 people were attributed to LBDs — the same number since the start of the yellow vests movement in November 2018 to present. A projectile of the LBD40 type, for example, launched at over 90 meters/second (324 kilometers per hour) has an impact force of 200 joules [rate of energy aborption]: that’s like having a 20 kilograms of concrete block thrown on to your face or head from one meter’s height! In principle, LBD should only be used in the area of the “torso, upper or lower limbs,” according to Eric Morvan, director general of the national police. Unfortunately, accuracy is haphazard, inflicting numerous injuries. French police have also used sting-ball grenades to enforce the order. Loaded with explosive trinitrotoluene (TNT), their detonation propels metallic fragments with a blast effect that can wound and deafen. France is one of the last countries in Europe to employ LBD, along with Poland, Hungary, Turkey and Greece. on March 18, 2019, in Paris, France. Photo by the author, used with permission. Yellow vest protests kicked off in France as a reaction to fuel tax increases but rapidly transformed into weekly protests. Every Saturday, protesters take to the streets to campaign for new tax policies, greater purchasing power, a citizen’s referendum, and the resignation of President Emmanuel Macron. Since November, the demonstrations have led to numerous instances of damage to property in several towns. Ten people have lost their lives “indirectly” in road accidents connected to the demonstrations. In Marseille, a woman died after being hit by an exploding grenade. S'il n'y avait pas de magasins pillés, de barricades érigées. S'il n'y avait pas de voitures brûlées, de bâtiments publics saccagés. S'il n'y avait pas de forces de l'ordre lynchées. If there were no shops being looted, barricades being put up. If there were no cars being set alight, public buildings being sacked. If there were no law enforcement officers being mobbed. In other words, if the law was being respected, no one would be getting hurt. Alexis Kraland, an independent journalist, instantly responded on Twitter, drawing attention to the injured without any direct connection to the demonstrations. Since November, when the movement began, 243 complaints have been submitted to the General Inspectorate of the National Police Service, whose mission is to ensure police follow correct procedures. It has a total of 174 active investigations, according to Castaner, the Minister of the Interior. These investigations will establish whether officers have applied “proportionate” force. “Abuses will be punished,” announced the minister. 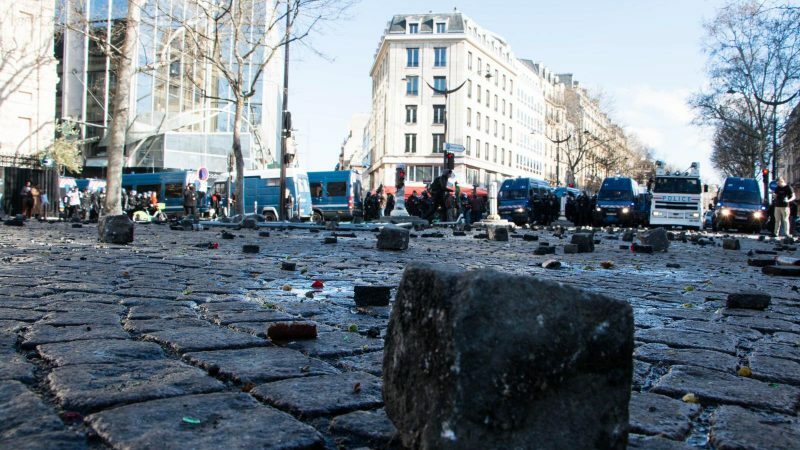 Defender of Rights, France’s official human rights ombudsman, Jacques Toubon,expressed concern in his annual report over the “routine use of rubber bullet launchers,” and urged a ban on them as well as explosive grenades. United Nations’ Michelle Bachelet of the High Commissioner of Human Rights, has also called for an “in-depth inquiry” into incidences of police violence in France. Do not speak of ‘repression’ or ‘police violence’ — these words are unacceptable in a state under the rule of law. In the town of Nice, during the yellow vests’ “Act 19,” which stands for 19th consecutive weekend of protest by the Yellow Vests, a 73-year-old demonstrator sustained a head injury in a fall. Ten days later, this version was disproved by the examining magistrate of Nice, who ruled that an individual police officer had in fact been the cause of the senior citizen’s fall.